Why compare obesity-susceptibility across populations of diverse ancestry? The prevalence of obesity has nearly doubled worldwide over the past three decades, but substantial differences exist between nations. Although these differences are partly due to the degree of westernization, genetic factors also contribute. To date, little is known about whether the same genes contribute to obesity-susceptibility in populations of different ancestry. We review the transferability of obesity-susceptibility loci (identified by genome-wide association studies) using both single nucleotide polymorphism (SNP) and locus-wide comparisons. SNPs in FTO and near MC4R, obesity-susceptibility loci first identified in Europeans, replicate widely across other ancestries. SNP-to-SNP comparisons suggest that more than half of the 36 body mass index-associated loci are shared across European and East Asian ancestry populations, whereas locus-wide analyses suggest that the transferability might be even more extensive. Furthermore, by taking advantage of differences in haplotype structure, populations of different ancestries can help to narrow down loci, thereby pinpointing causal genes for functional follow-up. Larger-scale genetic association studies in ancestrally diverse populations will be needed for in-depth and locus-wide analyses aimed at determining, with greater confidence, the transferability of loci and allowing fine-mapping. Understanding similarities and differences in genetic susceptibility across populations of diverse ancestries might eventually contribute to a more targeted prevention and customized treatment of obesity. Worldwide, the prevalence of adult obesity has almost doubled over the past three decades . The increase in the United States and other high-income countries has drawn attention because of the generally high prevalence of obesity in these countries [2–4], but the obesity epidemic is also spreading to middle- and low-income countries . Globally, the prevalence of obesity increased from 4.8% in 1980 to 9.8% in 2008 for men, and from 7.9% to 13.8% in women, paralleled by an increase in mean body mass index (BMI) of 0.4 to 0.5 kg/m2 per decade (equivalent to 1.2 to 1.4 kg per decade for a person 1.6 to 1.8 m tall) . By 2008, mean BMI had reached 23.8 kg/m2 for men and 24.1 kg/m2 for women . However, substantial differences between nations have been noted; for example, since the 1980s, mean BMI has increased the most in Oceania (1.3 kg/m2 per decade in men, 1.8 kg/m2 per decade in women), whereas no change in BMI was observed in Central Africa (men) and Central and Eastern Europe (women) . By 2008, the mean BMI in many countries from Melanesia, Micronesia and Polynesia was greater than 30 kg/m2, whereas in several countries of sub-Saharan Africa and in East, South and Southeast Asia, it was less than 21.5 kg/m2 . Differences in mean BMI and obesity prevalence across nations are, at least in part, due to the degree that the westernized lifestyle has been adopted [5, 6]. In addition, genetic factors contribute to obesity-susceptibility, with heritability estimates ranging between 40 and 70% across populations, without a systematic higher or lower influence for any specific ancestry . Little is known, however, about whether the same genes contribute to obesity-susceptibility across all ancestries or whether there are obesity-susceptibility genes that are unique to specific ancestries. Large-scale genome-wide association studies (GWAS) have identified at least 58 genetic loci that are robustly associated with obesity-related traits. The majority of loci have been discovered through GWAS in populations of European ancestry, but a growing number of studies are now being performed in populations of non-European ancestry. Here, we review the extent to which obesity-susceptibility loci are shared across populations of different ancestry and summarize the new insights that have been gained by cross-ancestry comparisons. There are at least two reasons for comparing genetic loci across populations of diverse ancestry. First, cross-ancestry comparisons can shed light on the physiology that underlies obesity-susceptibility around the world. Genetic loci that are shared across most ancestries may be indicative of core physiological pathways that are implicated in obesity-susceptibility, irrespective of ancestry. Such pathways might relate to general mechanisms that control the regulation of energy balance and body-fat distribution. Alternatively, loci that are specific to a single ancestry might contribute to differences in obesity-susceptibility between populations. Such loci could explain, for example, why Pima Indians are much more susceptible to gaining weight than other Americans, even though they live in the same westernized environment , or why the prevalence of obesity-related comorbidities differ across different races and ethnicities . A second reason for cross-ancestry comparison relates to the fine-mapping of established obesity-susceptibility loci. Genetic loci identified through GWAS often harbor multiple genes, or sometimes no genes at all, which represents a major barrier for the follow-up of discoveries into functional research. By taking advantage of differences in the genetic architecture between ancestries, genetic loci can be narrowed down, eventually to pinpoint the causal gene(s) and/or genetic variant(s) that underlie the observed GWAS association. We will illustrate both applications using (publicly) available data from large-scale, and thus sufficiently powered, genetic association studies, and we report solely on genetic loci for which the association with the obesity trait reached genome-wide significance (P < 5 × 10-8). The search for obesity-susceptibility loci in humans started in the 1990s with candidate gene and genome-wide linkage studies [10, 11]. Despite the large number of studies conducted over the past 30 years, these two approaches have identified only a few genetic loci that are robustly associated with common obesity- or adiposity-related traits [10, 11]. The limitation of these approaches can often be ascribed to the small-scale of most of the studies and consequently insufficient power to identify the expected small genetic effects, and to the limited knowledge of human genetic variation and linkage disequilibrium (LD), particularly in the early years. The advent of the genome-wide association approach in 2005, however, has substantially accelerated the pace of gene discovery for many common diseases and traits [12, 13], including obesity-related traits . We focus our review on the GWAS-identified loci because of the robustness of the associations and the availability of GWAS across populations of diverse ancestry. GWAS of obesity-related traits have been performed predominantly in populations of European ancestry, and have, to date, identified 35 loci for BMI, three loci for body-fat percentage, five loci for waist circumference, 14 loci for BMI-adjusted waist-to-hip ratio (WHRadjBMI), three loci for abdominal subcutaneous tissue (SAT) and visceral adipose tissue (VAT), six loci for extreme and early-onset obesity and nine loci for common childhood obesity. After accounting for the overlap of loci across traits, GWAS in populations of European ancestry have identified 54 obesity-susceptibility loci (Additional file 1; Figure 1). Obesity-susceptibility loci discovered through genome-wide association studies (GWAS) for body mass index (blue), three waves of GWAS for waist circumference and waist-to-hip ratio (pink) and two waves of GWAS for extreme and early onset of obesity (green). Each Venn diagram represents the loci from one paper, except for papers that discovered only one locus, that is, the fat mass and obesity associated gene FTO [14, 15, 33] and the near-MC4R loci [16, 36], for which no Venn diagram was drawn. An additional three BMI-associated loci (TOMM40-APOE-APOC1, SREBF2, and NTRK2) were identified using the gene-centric ITMAT-Broad-Candidate Gene Association Resource (IBC) array ; these are not depicted. Figure modified and updated from Loos . To date, 32 BMI-associated loci have been identified over the course of four consecutive waves of GWAS meta-analyses; each subsequent wave being larger and more fruitful than the preceding. The first obesity-susceptibility locus, in the first intron of FTO, was identified by two relatively small GWAS (NGWAS ~5,000) in 2007 [14, 15]. One year later, a GWAS meta-analysis for BMI of nearly 17,000 individuals confirmed the FTO locus and identified a second locus near MC4R . In 2009, the GIANT (Genetic Investigation of ANthropometric Traits) consortium was established to further increase the sample size, combining 15 GWAS for BMI (NGWAS ~32,000) . At the same time, the deCODE Genetics research group performed a GWAS for BMI of a similar size . Both studies confirmed the FTO and near-MC4R loci, and identified an additional ten loci [17, 18]. In 2010, the GIANT Consortium expanded further by combining 46 GWAS for BMI, including around 124,000 individuals in total, which confirmed the 12 previously established BMI loci and identified an additional 20 loci . Besides GWAS, the IBC (ITMAT-Broad-Candidate Gene Association Resource (CARe)) gene-centric array, comprising nearly 50,000 single nucleotide polymorphisms (SNPs) across approximately 2,100 metabolic and cardiovascular-related loci, has been used to identify obesity-susceptibility loci . A meta-analysis of the IBC array of nearly 93,000 individuals of European descent identified three additional BMI loci (TOMM40/APOE/APOC1, SREBF2, and NTRK2) and confirmed seven of the previous GWAS-identified BMI loci . Taken together, a total of 35 BMI-associated loci have been reported for populations of European ancestry. While BMI is generally a good indicator of overall adiposity, it does not distinguish fat from lean mass. Hence, a GWAS meta-analysis for body-fat percentage, as a more accurate estimate of body composition, involving data from 15 studies (NGWAS ~36,500) was performed . Besides the locus in FTO, loci near IRS1 and near SPRY2 were identified. Interestingly, the fat-percentage-increasing allele of the near-IRS1 locus is associated with a lower risk of type 2 diabetes  and cardiovascular disease , as well as with a favorable lipid profile . This association may be mediated through the fact that the fat-percentage-increasing allele is associated with increased SAT, but not with the metabolically more harmful VAT . These effects are significantly more pronounced in men than in women . The near-SPRY2 locus that associates with body-fat percentage is 50 kb upstream of the gene and seems independent (LD r2 <0.01) of the near-SPRY2 locus found to be associated with type 2 diabetes in East Asians  and Europeans , which locates approximately 200 kb downstream of SPRY2. On the basis of the hypothesis that distinct physiological pathways govern overall adiposity and abdominal adiposity, GWAS have been performed using proxy traits for body-fat distribution. The first two GWAS meta-analyses, by the GIANT consortium  and the CHARGE (Cohorts for Heart and Aging Research in Genomic Epidemiology) consortium , focused on waist circumference. All five identified loci were later confirmed by GWAS for BMI and for early-onset extreme obesity [19, 30], suggesting that these loci are associated with overall adiposity, rather than specifically with body-fat distribution. When the GIANT consortium expanded in 2010, WHR (instead of waist circumference) was chosen as the parameter used to assess fat distribution . In addition, to account for possible influences of overall adiposity, WHR was further adjusted for BMI. This meta-analysis combined data from 32 GWAS (NGWAS ~77,000), and identified 14 WHRadjBMI loci . Seven of the 14 loci have a significantly more pronounced effect in women than in men . While WHR is a non-invasive and inexpensive estimate of abdominal obesity, it does not allow discrimination between SAT and VAT. This distinction is important as a propensity to store fat viscerally rather than subcutaneously (as assessed by VAT/SAT ratio) is metabolically more harmful. A GWAS meta-analysis of data on VAT and SAT, quantified using computed tomography (CT), from more than 10,000 individuals identified three loci . The FTO locus was associated with SAT; the LYPLAL1 locus, previously identified in association with WHRadjBMI, was associated with VAT/SAT ratio; and a novel locus near THNSL2 was associated with VAT in women but not men . Individuals with early-onset and extreme obesity might be enriched for genetic variants that predispose to common obesity in the general population. Thus, GWAS comparing extremely obese individuals with lean controls might have greater statistical power than typical GWAS of quantitative obesity traits in the general population. Such GWAS have, to date, identified three additional obesity-susceptibility loci, while confirming the FTO, near-MC4R, and near MSRA loci [30, 33, 34]. A meta-analysis of 14 GWAS of childhood obesity, defined as a BMI ≥95th percentile for a given age (<18 years of age), identified two loci that had not been identified before in studies of adults and confirmed seven previously identified (adult) BMI loci . In 2008, a GWAS for waist circumference in 2,684 Indian Asians identified the locus near-MC4R  at the same time that this locus was identified for BMI in Europeans . No other or larger GWAS in populations of Indian Asian ancestry has been reported to date. The first GWAS in individuals of East Asian ancestry was performed in 2009. Genotypes of more than 8,800 Koreans were analyzed for association with eight metabolic and cardiovascular traits, including BMI and WHR . This study confirmed the FTO locus but no new loci were identified for BMI . For WHR, a SNP (rs2074356) in HECTD4 reached genome-wide significance . While common in East Asians - minor allele frequency (MAF) 11% in CHB (Chinese Hans of Beijing), 20% in JPT (Japanese of Tokyo), 15% in Koreans - this SNP is not polymorphic in individuals of European or African descent. It is in moderate LD (LD r2CHB/JPT = 0.58) with the Glu504Lys coding variant in ALDH2, which encodes an enzyme involved in alcohol metabolism. In 2012, two GWAS meta-analyses for BMI in East Asians were reported, each involving around 27,000 individuals (Additional file 1; Figure 1) [38, 39]. Associations of 11 loci reached genome-wide significance, and four of these loci (KLF9, CDKAL1, near GP2 and near PCSK1) had not previously been reported as obesity-susceptibility loci in European ancestry populations [38, 39]. The previously identified non-synonymous SNPs in a candidate gene study of PCSK1 in Europeans  seem independent of the locus reported in the GWAS of East Asian ancestry individuals (LD r2 < 0.10 in both the CHB/JPT and CEU (Utah residents with northern and western European ancestry) populations). We describe the overlap between European and East Asian ancestry BMI loci in greater detail below. 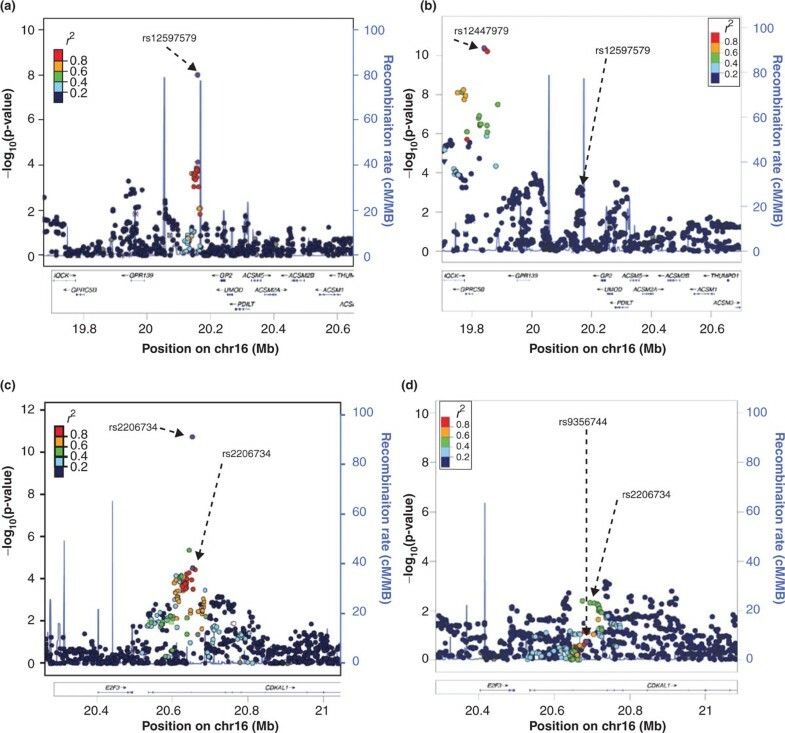 Taken together, GWAS in East Asians have identified one locus associated with WHR and four loci associated with BMI that had not been identified before in populations of European ancestry. Two relatively small (NGWAS ~1,800) GWAS for BMI in individuals of African ancestry [41, 42] and a GWAS of 1,792 Filipino women  confirmed some of the loci previously identified in GWAS of European ancestry populations, but none were able to identify any new loci. A low-density GWAS of 413 Pima Indians identified a locus in A2BP1 that is associated with body-fat percentage, which was not replicated in Old Order Amish or Europeans . Large-scale GWAS meta-analyses will be needed to establish more convincingly whether the identified obesity-susceptibility loci are specific to these ancestries or whether they are shared with other ancestries. Since the first GWAS discoveries, numerous studies have examined whether the identified obesity-susceptibility loci are transferable across populations of other ancestry. As more than 90% of the current obesity-susceptibility loci were first identified in populations of European ancestry, almost all studies reported to date aimed to replicate these European-identified loci in non-European ancestry populations. The majority of these replication studies limited their analyses to the GWAS-identified (index) SNP only. Few examined the wider locus surrounding the index SNP to account for potential differences in genetic architecture between the different ancestries. A major challenge that many studies face is the often limited statistical power to replicate associations as sample sizes tend to be relatively small. After all, the majority of obesity-susceptibility loci have been identified in GWAS meta-analyses of 30,000 to 124,000 individuals. Hence, large-scale studies will be required to confirm or refute with confidence whether a SNP or locus associates with obesity-related traits in other-ancestry populations. We have focused our review of the transferability of obesity-susceptibility loci on observations from larger studies (N > 5,000 or the largest study for a given ancestry, typically N > 1,500) that examined the BMI-associated loci, for which there are convincing data from an already large body of literature. We have also taken advantage of the available data from the recent, and currently largest, GWAS of BMI in populations of East Asian [38, 39] and European ancestry  to illustrate how the SNP-to-SNP versus locus-wide comparison can lead to different conclusions. Studies that assess the transferability of the obesity-susceptibility loci by SNP-to-SNP analyses only test whether the GWAS-identified SNP shows association with obesity-related traits in their population. SNP-to-SNP analyses are cost-efficient, as only one SNP per locus needs to be genotyped. If, however, replication is tested in an ancestry that has a different genetic architecture (for example, haplotype structure differences or allelic heterogeneity) from the ancestry in which the discovery was made, then the interpretation of transferability is limited. For example, when making a discovery, we assume that the GWAS-identified (index) SNP is in strong LD with the causal variant (that was not genotyped) in the discovery population. 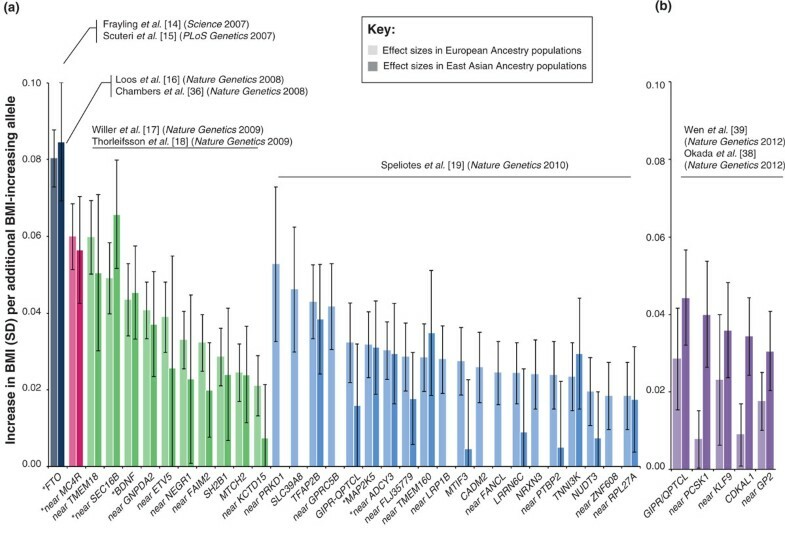 If replication of this index SNP is tested in a second population with a different ancestry, it is possible that the LD between the index SNP and the causal SNP is weaker in this second ancestry population than that in the discovery population, resulting in a weaker or no association with the obesity trait. Yet, other SNPs in the same locus might show strong LD with the causal SNP in the second population, and if tested, they would show association with obesity-related traits. If they are not tested for association, as is the case in SNP-to-SNP comparisons, one may wrongly conclude that the locus does not transfer across ancestries. Thus, SNP-to-SNP comparison allows confirmation of the transferability of a locus when the index SNP shows association in other ancestries. If, however, the index SNP shows no association in other ancestries, transferability is not refuted. This is an important limitation to be kept in mind when interpreting the replication studies in the literature. The FTO locus was first identified in European ancestry populations in which each additional minor allele increases BMI by 0.39 kg/m2 (equivalent to 1,230 g for a person 1.7m tall) and increases the risk of obesity by 1.2-fold . Of all currently identified loci, the FTO locus has the largest effect on obesity-susceptibility and its BMI-increasing allele is common in European ancestry populations: approximately 18% carry two BMI-increasing alleles and another 49% carry one BMI-increasing allele. Even though the effect of this locus is the largest known and the allele frequency is common, the FTO locus explains only 0.31% of the inter-individual variation in BMI (Table 1) . Because FTO was the first identified obesity-susceptibility locus, many replication efforts in non-European ancestry populations have been conducted. Small sample sizes may have led to inconsistent results in early studies, but in the past few years, there has been growing and convincing support for the transferability of the FTO locus across almost all ancestries that have been studied. More specifically, SNPs that cluster in the FTO locus have been found to associate with increased obesity-susceptibility in the Chinese [39, 45–51], the Japanese [38, 52–55], Koreans [37, 56], Filipinos , the Vietnamese , Malays [46, 49], Indian Asians [45, 49, 58–63], Pima Indians , Hispanics [65–69] and, although somewhat less consistently, also in Africans and African Americans [69–75]. The table includes 32 SNPs identified in European Ancestry populations [14–19, 36] and four SNPs identified in East Asian ancestry populations [38, 39], sorted by year of discovery and subsequently by effect size in the population in which discovery was made. Data were obtained and adapted from Speliotes et al. and from Wen et al. . The locus near-MC4R was the second GWAS-identified obesity-susceptibility locus, discovered in European  and Indian Asian  ancestry populations. This BMI-increasing allele has a substantially smaller effect on BMI (0.23 kg/m2/allele, equivalent to 665 g for a person 1.70 m tall) and obesity risk (odds ratio 1.11/allele) and is much less frequent (5% of Europeans carry two and 36% carry one BMI-increasing allele) when compared to the FTO locus (Table 1) . The evidence for transferability of the near-MC4R locus, although not yet as strong as that for the FTO locus, is growing for a number of different ancestries, including the Chinese [39, 51, 76–79], the Japanese [38, 80], Koreans [37, 81], Filipinos , Indian Asians [60, 82, 83], Hispanics , and Africans and African Americans [18, 74, 85, 86]. SNPs identified by the more recent GWAS meta-analyses, which included more than 30,000 individuals at the discovery stage, show much less consistency in SNP-to-SNP comparisons between ancestries. This is most probably due to too small sample sizes and thus a lack of statistical power to confirm associations, but it could also be due to differences in the genetic architecture of the different ancestry populations. The recent two GWAS meta-analyses for BMI in East Asians reported association results that allowed comprehensive SNP-to-SNP comparisons [38, 39]. More specifically, they provided association results from their GWAS-meta-analyses (N > 64,000) for all 32 previously GWAS-identified SNPs. In addition, they provided results from European ancestry GWAS meta-analyses for the newly identified loci in their GWAS (Table 1 and Figures 2 and 3). Of the 32 BMI-associated SNPs identified first in European ancestry populations, eight SNPs (in or near PRKD1, SLC39A8, GPRC5B, LRP1B, FANCL, NRXN3, CADM2 and ZNF608) are not polymorphic in East Asians (Table 1 and Figures 2a and 3b). Thus, on the basis of the SNP-to-SNP comparison, they are considered non-transferable. The associations for the remaining 24 SNPs with BMI in East Asians are all directionally consistent with those observed in European-ancestry populations (Figures 2a and 3a). For 6 of these 24 European ancestry-identified loci (in or near FTO, MC4R, BDNF, SEC16B, MAP2K5 and ADCY3/RBJ/POMC), associations reached genome-wide significance in East Asians and are therefore considered to be transferable across European and East Asian ancestry (Table 1 and Figures 1 and 2a). Even though the transferability of the remaining 18 loci identified in European populations seems less clear-cut, the effect sizes of 12 of these loci (in or near TMEM18, GNPDA2, ETV5, NEGR1, FAIM2, SH2B1, MTCH2, TFAP2B, FLJ35779, TMEM160, TNNI3K and RPL27A) on BMI in East Asians are comparable to those observed for European-ancestry populations (Table 1 and Figure 2a), with most reaching nominal significance and some approaching genome-wide significance (Table 1). The effects of the six other loci (in or near KCTD15, GIPR/QPTCL, MTIF3, LRRN6C, PTBP2 and NUDT3) are much less pronounced (P-values >0.20) in East Asian than in European ancestry populations (Table 1 and Figure 2a and 3b). Thus, of the 32 European-ancestry identified BMI loci, SNP-to-SNP comparisons suggest that 18 SNPs (56%) show comparable effects on BMI in European and East Asian ancestry populations, eight SNPs (25%) are non-polymorphic in East Asians, and for six SNPs (19%) there is as yet no evidence of transferability to East Asian ancestry populations. Effect sizes for (a) the 32 BMI-associated SNPs identified in European ancestry populations and (b) the five BMI-associated SNPs identified in East Asian ancestry populations. The lighter shaded bars represent the effect sizes (and 95% confidence interval (CI)) in European ancestry populations  (in both (a) and (b)), the darker shaded bars represent the effect sizes (and 95% CI) in East Asian ancestry populations [38, 39]. Data were obtained and adapted from Wen et al. and are presented in Table 1. Asterisks indicate SNPs that reached genome-wide significance in GWAS meta-analyses of East Asian ancestry populations . SD, standard deviation. SNP-to-SNP comparison of (a) effects on BMI, (b) frequency of BMI-increasing alleles, and (c) explained BMI variance in East Asian ancestry populations (y-axis) and European ancestry populations (x-axis) of the 32 BMI-associated loci identified in European ancestry populations (blue diamonds) and five BMI-loci additionally identified in East Asian ancestry populations (green squares). Data were obtained and adapted from Wen et al. and are presented in Table 1. SD, standard deviation. As some of the BMI loci were identified by a GWAS meta-analysis of more than 123,000 European ancestry individuals, a larger sample size of East Asian ancestry individuals might be needed to provide firmer evidence of the transferability of the European ancestry BMI loci. Furthermore, as noted above, the SNP-to-SNP comparison has major limitations as it does not account for differences in genetic architecture between the two ancestries. This limitation is illustrated by the GIPR/QPTCL locus, which was first identified in European ancestry populations . At first sight, the GIPR/QPTCL locus does not seem to be transferable to East Asian populations as the effect of the SNP (rs2287019) representing this locus in European ancestry populations is much less pronounced in East Asians [38, 39] (Table 1 and Figure 2a). However, the GWAS in East Asian ancestry populations identified another SNP (rs11671664) in the same GIPR/QPTCL locus, the effect of which is less pronounced in European ancestry populations  (Table 1 and Figure 2b). The LD between the two SNPs is very low in East Asian ancestries (r2CHB/JPT = 0.08) and modest in European ancestries (r2CEU = 0.43), which suggests that the GIPR/QPTCL locus is an obesity-susceptibility locus in both European and East Asian ancestry populations, represented by ancestry-specific SNPs that each may be in LD with the same causal variant. A more in-depth analysis that takes advantage of differences in genetic architecture between ancestries will be required to pinpoint the causal variant(s). Besides the GIPR/QPTCL locus, the recent GWAS meta-analyses in East Asian ancestry populations identified four BMI-associated loci that had not been identified before in large-scale GWAS of European ancestry populations [38, 39] (Table 1 and Figures 1 and 2b). SNPs representing each of the four loci in East Asian ancestry populations show directionally consistent association in European ancestry populations (Figures 2b and 3a). For the near KLF9 locus, however, the association with BMI in European ancestry populations is not significant (P-value = 0.45; Table 1 and Figure 2b). For the CDKAL1 locus, the rs9356744 SNP identified by Wen et al. suggests no evidence of transferability to European ancestry populations (P-value = 0.18) (Table 2 and Figure 2b). However, the rs2206734 SNP identified by Okada et al. would suggest transferability of this locus (P-value = 0.005). While the LD between these two CDKAL1 SNPs is high in East Asian ancestry populations (r2CHB/JPT = 0.93), it is much more modest in European ancestry populations (r2CEU = 0.36), emphasizing the need for locus-wide comparisons (see also next section and Figure 4c,d). Even though the effect sizes of the two other loci (near GP2 and PCSK1) are relatively small, the associations reach nominal significance (Table 1 and Figure 2b). Taken together, the SNP-to-SNP comparisons suggest that two of the four loci identified in East Asian ancestry populations show some evidence of transferability to European ancestry populations, albeit this evidence is not as convincing as for the transferability of European-identified loci to East Asian ancestries. Regional plots of (a,b) the GP2 / GPRC5B and (c,d) the CDKAL1 loci in East Asian ancestry populations and European ancestry populations, respectively . SNPs are plotted by position on the chromosome against association with BMI (-log10 P-value). Recombination rates (from HapMap) are plotted in blue to reflect the local LD structure. The SNPs surrounding the most significant SNP (in purple) are color coded to reflect their LD with this SNP (r2 values from the HapMap CHB/JPT and CEU data, respectively). In an overall SNP-to-SNP comparison of the 36 BMI-associated loci (Figure 3), we see that SNPs that were first identified in European ancestry populations have generally a larger effect and greater explained variance in European ancestry populations than in East Asian ancestry populations and, vice versa, that SNPs first identified in East Asian ancestry populations have a larger effect and explained variance in East Asian than in European ancestry populations. This is not a surprise and is consistent with the fact that SNPs with larger effects and greater explained variance are statistically more easily discovered (Figure 3a,c). The frequency of the BMI-increasing allele of European-identified SNPs tends to be higher in European than in East Asian ancestries. Interestingly, the frequency of the BMI-increasing allele of East Asian-identified SNPs is also higher in European than in East Asian ancestry populations (Figure 3b). Taken together, the SNP-to-SNP comparison suggests that around 50% of the BMI-associated loci identified in European ancestry populations transfer to East Asian ancestry populations and vice versa. However, the non-transferability of the remaining 50% of BMI-associated loci cannot be substantiated because of the relatively small sample size and thus the insufficient statistical power of the East Asian GWAS meta-analyses to replicate some of the recently identified loci in Europeans, and also because of the limitations of the SNP-to-SNP comparison. In locus-wide comparisons, not only is the GWAS-identified (index) SNP examined for transferability to another ancestry but also the SNPs surrounding the index SNP are tested. Locus-wide comparisons are more comprehensive and account for differences in the genetic architecture between ancestries. The data needed for such comparisons are not, however, always available. For example, we showed earlier that of the 32 GWAS-identified BMI-associated SNPs found in European ancestry populations, 8 SNPs were non-polymorphic and another 6 showed no convincing evidence of association in East Asian ancestry populations. To firmly exclude the transferability of these 14 loci, not only the index SNP but also all other SNPs in the region must be examined, but these data are not publicly available at present. Using the publicly available data from the latest GWAS meta-analysis for BMI from the GIANT consortium , we illustrate how the BMI-associated loci identified in East Asian ancestry populations, of which the SNP-to-SNP transferability to European ancestry populations was doubtful, do show evidence of transferability when the whole locus is examined. The first example focuses on the GP2 locus, of which the rs12597579 SNP is associated with BMI at genome-wide significant levels in East Asians, whereas the association in European ancestry populations, though directionally consistent with that in East Asians, is not as convincing (P = 9 × 10-3; Table 1). When examining the wider locus, however, SNPs at less than 325 kb downstream of GP2-rs12597579 show genome-wide significant association in European ancestry individuals, of which the most significant SNP (rs12444979 near GPRC5B) is not polymorphic in East Asians (Table 1 and Figure 4a,b). Thus, although the SNP-to-SNP comparisons discussed earlier suggested possible transferability of GP2-rs1257579 to Europeans and no evidence of transferability of GPRC5B-rs12444979 to East Asians (Table 1 and Figure 2), a locus-wide comparison depicts a more comprehensive picture, suggesting that GP2 and GPRC5B might be part of the same locus, which possibly represents one causal gene that is common to European and East Asian ancestry populations. Interestingly, in European ancestry populations, GPRC5B-rs12444979 is in perfect LD with a copy number variant . Our second example focuses on rs9356744 in CDKAL1, which showed genome-wide significant association with BMI in East Asian ancestry populations [38, 39] but not in European ancestry populations (P-value = 0.19)  (Table 1 and Figures 2 and 4). When examining the locus surrounding rs9356744, however, there is evidence that other SNPs that are not in LD with rs9356744 are also associated with BMI in European ancestry populations (P-values <10-3)  (Figure 4d), supporting the transferability of the CDKAL1 locus. More rigorous analyses of each of the extended loci will be needed to establish transferability across ancestries, but these examples of locus-wide examinations provide preliminary insights to suggest that the transferability of obesity-susceptibility loci across ancestries might be more extensive than is suggested by SNP-to-SNP comparisons. Differences in the genetic architecture and LD structure of different ancestries can help to narrow down the locus in order to pinpoint the causal gene or variants, at least for loci that are transferable across populations of different ancestry. As the LD between SNPs in African ancestry populations is generally less extensive than that in European and East Asian ancestry populations, African populations are particularly suited for fine-mapping efforts. To date, the FTO locus has been the focus of most fine-mapping efforts [70, 75, 87], mainly because, of all the obesity-susceptibility loci, FTO has SNPs that show the strongest associations with obesity-related traits, and the FTO locus is one of the most generally transferable obesity-susceptibility loci. The most recent and largest fine-mapping project for the FTO locus has been reported by the PAGE (Population Architecture using Genomics and Epidemiology) study group . The FTO locus is represented by a cluster of SNPs in the first intron of FTO at chr16q12.2. In the PAGE study, the genotypes of 3,756 SNPs across a 646-kb region in the first intron were interrogated for association with BMI in more than 20,000 African Americans . The most significant association with BMI in African Americans was observed for rs56137030. This SNP represents a cluster (r2CEU >0.50) of 103 SNPs in Europeans, but in African Americans - due to weaker correlations between SNPs - this cluster includes only 29 SNPs, spanning 44.5 kb . Six of the 29 SNPs locate within intronic regulatory elements, two of which are predicted to have allele-specific binding affinities for different transcription factors . This example illustrates the great value of locus-wide comparisons using populations of different ancestries. The weaker the LD structure and the larger the sample size of the other-ancestry population, the greater the power to narrow-down a locus. It should be noted that this approach requires the disease-locus to be transferable across the ancestries. Using the data currently available, we have shown that of all GWAS-identified loci, at least the FTO and near-MC4R loci seem to affect obesity-susceptibility in a wide range of ancestries. While much less information is available for other obesity-susceptibility loci, SNP-to-SNP comparisons of associations between European and East Asian ancestry populations suggest that at least half of the BMI-associated loci are shared across these two ancestries. Locus-wide comparisons suggest that the transferability might be even more extensive, but more rigorous analyses with larger samples will be required to establish these preliminary observations more firmly. The transferability of these loci is not unexpected: we might speculate that the general physiological pathways underlying obesity-susceptibility are shared across populations of different ancestries, whereas ancestry-specific susceptibilities are more likely to be caused by low-frequency variants that have not yet been identified. With the new genotyping arrays that focus on low-frequency and rare variants, studying populations of diverse ancestry will become even more important as such variants are more likely to be ancestry-specific. At present, the publicly available data on the genetic susceptibility to obesity in non-European ancestry populations is still limited. More and larger-scale collaborations, involving more ancestrally diverse populations with genome-wide genotype data of common and low-frequency variants, will be needed to establish the transferability of obesity-susceptibility loci to other ancestries. Furthermore, cross-ancestry comparison has the potential to fine-map loci that harbor multiple genes and eventually to pinpoint one or a few genes for functional follow-up analyses. 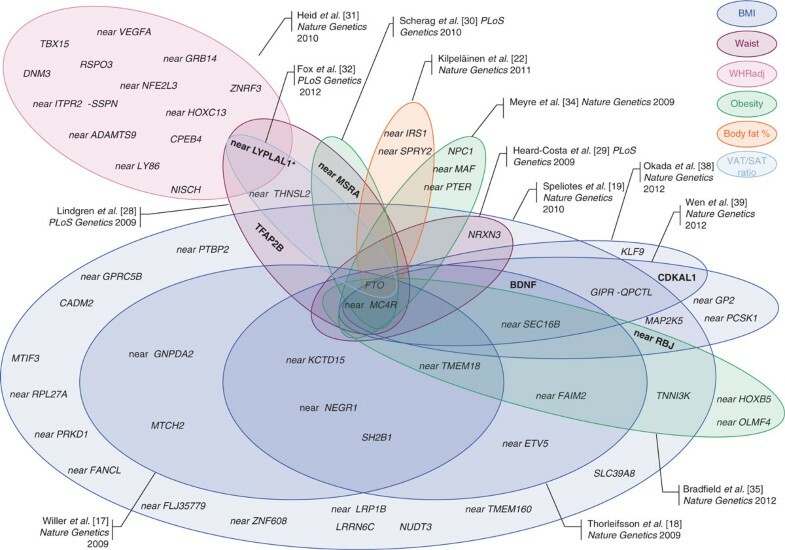 Fine-mapping of loci is a critical step in the translation of GWAS discoveries into functional research, and more large-scale efforts such as those for the FTO locus by the PAGE study will be important. Eventually, studying genetic susceptibility across populations of different ancestry will contribute to a better understanding of the mechanisms underlying obesity at a global level. Furthermore, understanding similarities and differences in genetic susceptibility across populations of diverse ancestries might eventually contribute to a more targeted prevention and customized treatment of obesity.